In Brighton & Hove, we have launched a local campaign to support of the international boycott of Hewlett-Packard (HP), aimed at raising awareness of HP’s complicity in the illegal Israeli occupation of Palestine and Israel’s racist system of apartheid. The local campaign got off to a roaring start on Saturday 15th November 2014, with street theatre and a shop occupation, targeting Curry’s PC World in Western Road in central Brighton. You can read a report of the demo, with photographs, here. 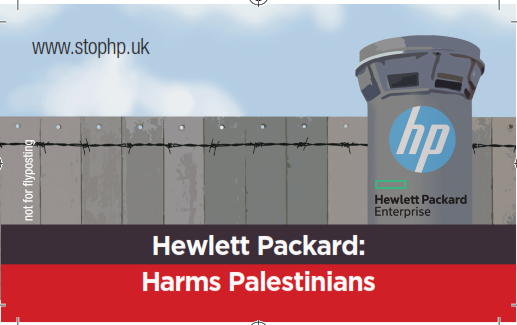 The demo was also reported as a news feed on the Ethical Consumer website: ‘Palestine Activists Target Hewlett-Packard’. UPDATE: Brighton & Hove Trades Union Council has unanimously passed a motion of support for our campaign against HP. Read more here.